We Are The Ones We've Been Waiting For:: Nearly 4 Million Seriously Mentally Ill Still Without Insurance | The Remedy: #SinglePayer: Everybody in. Nobody out. Nearly 4 Million Seriously Mentally Ill Still Without Insurance | The Remedy: #SinglePayer: Everybody in. Nobody out. 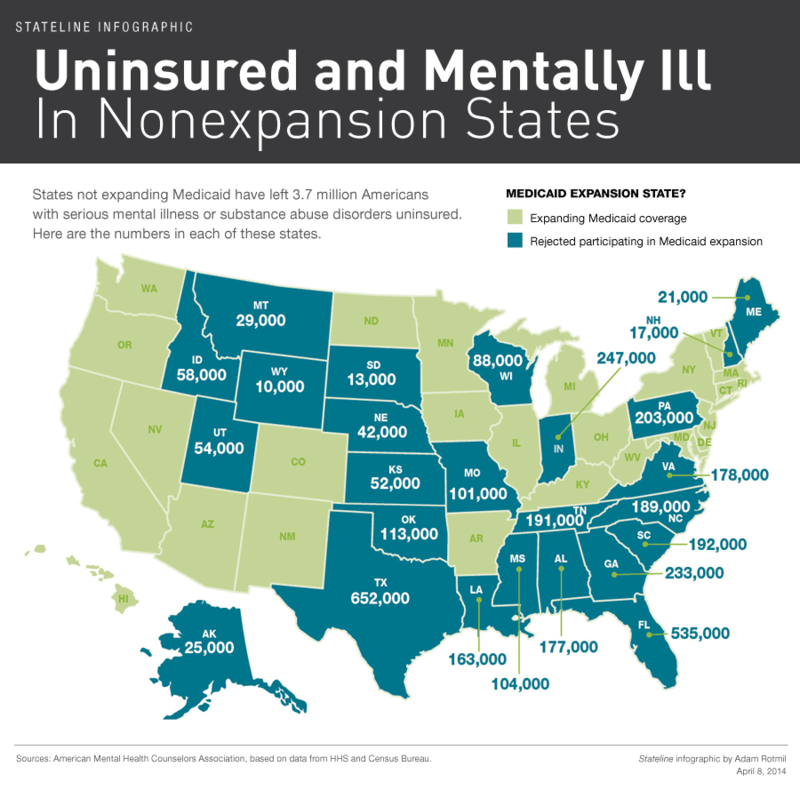 The 24 states that refused the Medicaid expansion have nearly 4 million people with severe mental illness without insurance. Some might consider Kelly Troyer of South Carolina lucky. She isn’t one of them. The federal health law could have added as many as 18.7 million more Americans to the Medicaid rolls. With only 26 states now participating, that number is down to about 8.1 million. If the 24 states that opted out of the Medicaid expansion continue to do so, they will forgo a total of $61.9 billion in federal revenues by 2022, according to a December Commonwealth Fund report. Governors in those states say they don’t trust the federal government to come up with the promised money and worry the states will be left having to make up the difference. Because of those reductions, mental health advocates have pressed hard for states to expand Medicaid eligibility. “Medicaid expansion is the single most important thing our leadership could do for people with mental illness,” said Greg Hansch, policy coordinator of the National Alliance on Mental Illness in Texas, which decided not to expand and left 652,000 low-income severely mentally ill Texans without coverage, according to the AMHCA report. Medicaid expansion would have helped address the state’s mental health needs, he said. Instead, he expects the situation will go from bad to catastrophic with “more people falling through the cracks, more of the mentally ill jailed, more homeless, all of the effects you have when there isn’t mental health treatment.” As it is, Ward said, the largest mental health ward in his home county of Sedgwick is the jail. The reason for that concentration, said Miller, the association’s director, is that these states generally had the most restrictive Medicaid eligibility requirements before the federal health law was enacted. Of the states that didn’t expand, Indiana had the highest percentage of adults with mental health conditions among those who would have been Medicaid-eligible – 62 percent. Georgia had the lowest at 27 percent, the report found. The primary source of information for the AMHCA report was the National Survey on Drug Use and Health cosponsored by the Substance Abuse and Mental Health Services Administration in the U.S. Department of Health and Human Services and the U.S. Census Bureau’s American Community Survey. Those criteria were derived from “Diagnostic and Statistical Manual of Mental Disorders,” published by theAmerican Psychiatric Association, which is used by most mental health care providers, health insurers and pharmaceutical companies. Republished from Stateline, a nonpartisan, nonprofit news service of the Pew Charitable Trusts that provides daily reporting and analysis on trends in state policy.